updates, and much more. New features! AnsiPlus v4.00 – feature full ANSI driver for DOS v3-6. Even includes screen saving capabilities. manufacturer is: Kristofer Sweger, P.O. Box 378, Larkspur, CA 94977.
results and performance is assumed by you. using the software you agree to this. notifying any person or group of such changes or alterations. respective manufacturers. Other trademarked names may appear in this manual. your keyboard input, and you spend a whole lot of time using it. * Screen output will be faster than with DOS's ANSI and non-ANSI drivers. * The user will have complete control over colors and VGA/EGA capabilities. ANSIPLUS features in all windowed and full screen DOS sessions. is found to be useful and is in regular use, then registration is required. * The TSR-capable registered version of the ANSIPLUS driver, ANSIPLUS.exe. Shareware, so it may not be copied for others. of ANSIPLUS with its CONFIG.sys. the mailing address for your registered ANSIPLUS and manual. 415/924-5407, and signed credit card orders may be sent by fax to 415/924-0258. of $100 or more, our terms are net 30 days. Credit references may be required. Zip file via CompuServe, or processing a EuroCheque may apply. corporation, or government organization, is not permitted. total per CD-ROM disk does not exceed US $50.00. installation or will not work properly if it detects attempts to change it. can deal with them efficiently in one short session. * What is the problem, or what is not behaving as expected? * What exactly must be done to cause the problem to appear? * What did you do to try to fix or work around the problem? any other software or hardware in use at the time. features. The remaining chapters give details regarding specific features. (i.e., CGA or monochrome boards). colors of the user's, or of ANSIPLUS's color scheme. background colors in text modes. the number of text lines used in any VGA/EGA video mode. driver for modes of 100h or higher. is automatically disabled in certain situations. that was on the screen, but has scrolled off the top. at any time and browse through recent screen contents. output can often fly by on the screen too fast to be read. between programs, but without having to retype the data. the keyboard. See "Special Keyboard and Mouse Functions"
in Chapter 4 for more information about this feature. (configurable for more if necessary). are then processed long after the key is lifted. startup of programs, software testing, and demonstrations. using or not using the tone generator. can be loaded as either a TSR program or a device driver. instead of the full capability ANSIPLUS driver. features, such as the screen blanker, that may interfere. initialized so often by OS/2. automatically has an independent ANSIPLUS as its console. so that it always reflects what has last been typed. through DOS or to all keys entered via BIOS Interrupt 16h. special reassignments in an application. "thinks" it is using a normal screen. suppresses output of these unintended blank lines. keyed entries are requested by DOS in a graphics mode. as in DOS standard console output. writes characters. ANSIPLUS includes a "transparent"
currently at the cursor position. for emphasis or improved legibility. continue to do so after ANSIPLUS is installed. to emulate a monochrome VGA monitor on a color monitor. current or default definition of colors, and more. API provides special functions for programmers. recent Shareware versions of ANSIPLUS. sub-directories of the user's choice), and updates CONFIG.sys and AUTOEXEC.bat. set the destination directory for each installed file or for classes of files. then the ANSIPLUS file will be copied over the matched file (i.e., updated). This is intended to make installation of ANSIPLUS updates a snap. updated, then the class directory will be the same as the updated files. Otherwise, the class directory will be "\ANSIPLUS". want to place the ANSIPLUS.sys device driver in the root directory. section, starting on page 15.
after the device driver is installed. it is directly compatible with ANSIPLUS. must be corrected by directly editing CONFIG.sys. changes that you must make if you will be running Windows and DISPLAY.sys. to 850, and then rename the driver back to "CONAPLUS". assumed to reside on either the target drive or the same drive as CONFIG.sys. and the ANSIPLUS driver, and this will override the search. the QEMM directory (create this file if it doesn't exist). entering a CTTY CON command after ANSIPLUS has been loaded. followed, ANSIPLUS Release 4.00 or later should be compatible. the directory that will receive the installed ANSIPLUS files. temporary sub-directory (but keep the ZIP file as a backup). after you reboot your computer. loading option) are installed by changing tables in the ANSIPLUS driver file. been altered after you have used NEWAPLUS. Just ignore this complaint. background colors: those that are currently on the screen, and "default"
NEWAPLUS color palette option will apply to the default palette. * ANSIPLUS can be loaded into low memory below 640K. This is the default. taken in the same manner as the VDISK.sys driver allocates extended memory. blocks is done correctly by Windows 3.1. See "ANSIPLUS and Windows 3,"
* ANSIPLUS can be loaded high, and then its shared code can be placed in HMA. total number of keys to be buffered. down before repeated keys will start to be generated, is also configurable. ANSIPLUS accepts four settings from 250 ms to 1000 ms.
releases its shift lock whenever a shift key is pressed. Caps Lock on completion of an "entry." generate a keyboard break whenever Ctrl+C is entered. option to return the last key from the buffer instead of the first. ke reassignments plus the current reassignments. of this table by specifying the maximum number of notes allowed in the beep. will be loaded when the video mode changes. loading for DOS 256-color modes if you are running such an application. Windows. However, a separate feature is provided to allow this if desired. when it is enabled, you will see only eight (or two) background colors. giving a clear visual separation of typed entries from computer output. it is shown in black. If this feature is not wanted, it can be disabled. operation, this feature should be disabled. it can be turned off. using the attribute controller instead. the screen saver from blanking the screen during a specific application. calls interfere with the mouse driver, they can be disabled. it should be left disabled. TTY) ordinarily cannot use ANSI Escape sequences for screen control. ANSIPLUS includes a feature to allow this. save them for later viewing. This viewing is called screen scroll-back. something, it can be disabled. scroll-back data to reside in video RAM. expanded memory), then video RAM will be used for scroll-back instead. with many Windows video drivers. resulting in loss of scroll-back text or incomplete updating of the screen. further information, see "ANSIPLUS and Windows 3" starting on page 43.
changing video modes or running graphics applications (including Windows). not containing DOS output, when they are cleared by BIOS call. by BIOS call when Windows is running. pages too when they are cleared. option is provided to capture such lines. capacity for scroll-back in the video RAM will be reduced by one page. combination instead (see next option). Scroll-Lock key will function with or without any other simultaneous key. display drivers when the DOS session is run in a window, not full screen. 3" starting on page 43 for further information. used with a communications program that scrolls the entire screen. cases, a feature can be enabled to cause BIOS calls for screen scrolling. over the mouse unless the screen has been frozen by the Scroll Lock key. and files with the ANSICOM.exe program. release the screen as long as the shift key is held down. application and the Windows clipboard without having to switch to a window. ANSIPLUS key reassignment tables with the NEWAPLUS.exe configuration utility. programs may have access to the data. on the left mouse button after Scroll Lock is on. text with the mouse is covered below in "Using the Mouse". Scroll Lock must be on or ANSIPLUS will NOT take control of the mouse. window or when you leave the mouse cursor sitting over an ANSIPLUS DOS window. line will cause the screen to scroll forward. empty a copy of the Windows clipboard will be pasted. This action is the same as hitting the Insert key. entry (same as hitting the Escape key). the same as hitting the Escape key. history window is showing, when it is a Down arrow. simulated by pressing both the left and right buttons simultaneously. made with SETCOLOR.exe are in effect only as long as your system is running. To change the colors for system bootup, use the NEWAPLUS.exe program. where each selects a foreground or background color or other option. the screen colors that will be used for text foreground and background. both color combinations from this sub-menu. your border color will apply only until the next display mode change. DEFAULT to select the current colors as the default colors. sample of lines from a SAVEFILE color definition file. used color files can reside in a directory on the PATH. programs can also be edited by the ANSICOM.exe utility program. program from loading the PAL/DAC and border color registers by BIOS calls. because it will keep well behaved programs from making color changes too. The SETCOLOR program also controls ANSIPLUS VGA monochrome monitor emulation. COLOR ends VGA monochrome monitor emulation and restores colors. menu of choices. These choices are shown in Table 4-4 below. RESET to set all features to their default values. HELP to show all keyword options. terminate it with the End key. SETAPLUS TONE 1397,110,1047,165 defines a two-tone Ctrl+G beep. and run through the feature options. * To enable or disable ANSIPLUS features that conflict with the program. restore it on completion (DOS 5.0 EDIT.com, DBASE III). black on completion (DBASE III). 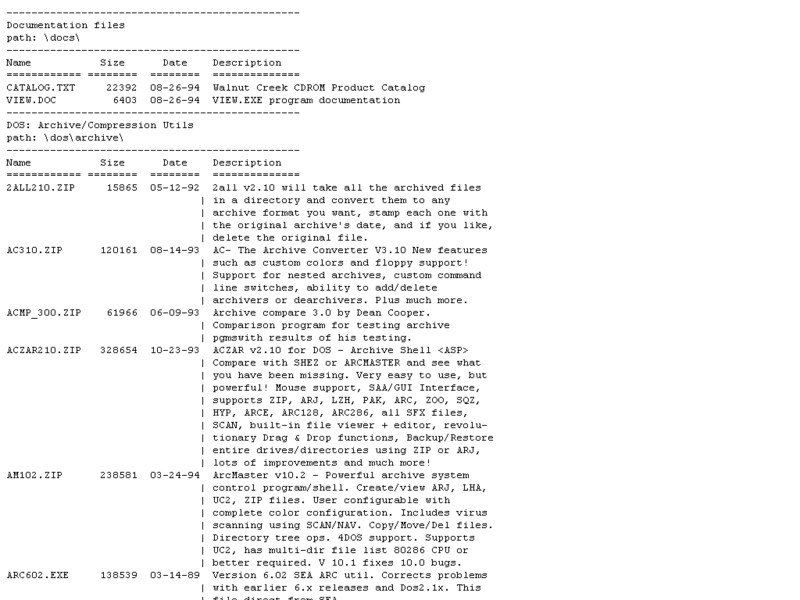 completion (DOS 5.0 EDIT.com, DBASE III). entire color scheme. This can be done at any time by hitting the letter "S"
palette and border colors that were in effect when the program was created. will keep well behaved programs from making any color changes. this facility: with it, the user can create and edit small executable ".com"
files or small printable text files that contain ANSI escape sequences. * If no file name is supplied, you will be presented with a menu of ".com"
refuse to edit the file. ANSICOM will ask if a new file is to be created. presented, and you can go to work. Use the F1 key for context sensitive help. settings, tone definition, key reassignment, etc. entirely new control functions. See "ANSIPLUS Extensions and the ANSI Standard"
on page 48 for differences between ANSIPLUS and the ANSI.sys driver. or by Windows in combination with other software. one global copy of ANSIPLUS would be shared among all virtual machines. the visible part of the virtual screen. applications that depend on scroll-back under Windows. reliable when used with many Windows video drivers. exercise caution before relying on video RAM for scroll-back under Windows. when it is full screen. required to test whether a DOS virtual machine is full screen or in a window. DOS session is in a window and disable screen blanking and mouse usage too. will have no control over the palette when running in a window. Windows DOS session will change the color for only that DOS session. WINVGA16.com will not work if run in WINSTART.bat because it is not a TSR. can be overridden by a configurable feature. INSTALL program when DISPLAY.sys is detected. This causes Windows to localize the ANSIPLUS driver to each virtual 8086. The SYSTEM.ini file is not altered by the ANSIPLUS INSTALL program. Windows is started, and the LOCAL=CONAPLUS line MUST be added to SYSTEM.ini! KSTACK.com driver will report that it is already installed. key stacking can be disabled if KSTACK.com or KEYSTACK.sys is preferred. scrolling control. Rough scrolling always applies in DOS windows. of the time when it initializes in a new virtual DOS machine. 8086's), because DESQview does not create local copies for each window. window would affect the colors used in other windows. driver, because DESQview will get it first. set up the window, and then executes the command associated with the window. DESQview terminates, the disabled driver must then reactivate itself. DESQview, so that the TSR copy in each window will require only about 6K. assign them different names in each DESQview window. The registered ANSIPLUS.exe device driver satisfies all these requirements. CTTY CON command in each window after ANSIPLUS.sys has been loaded. used to store scroll-back (EMS scroll-back is still allowed). also work with other task switchers that support this interface. Esc [#;#n Query ANSIPLUS status: cursor position, colors, etc. commands. Plus and minus signs are also accepted. exceptions are Esc E, Esc H and Esc J, which are all ANSI standard. graphics modes exceeding 800x600 resolution). * Unrecognized (usually CGA or Hercules) display modes. * All graphics modes under the reduced capability ANSIPLSR.sys driver. RAM access to some of these modes. to access variables within the running ANSIPLUS driver. above, then BX, CX, DL and ES will not be altered on return. coded as two hexadecimal nibbles. Thus, for Release 3.10, CL will return 10h. character string at ES:[BX-4], containing, for example, "4.00". drivers that take over any of these interrupts without passing calls through. reference in it to KEYB and you are not using Novell DOS. ANSIPLUS.sys device driver must be installed before DISPLAY.sys in CONFIG.sys. The INSTALL program will also automatically handle this.